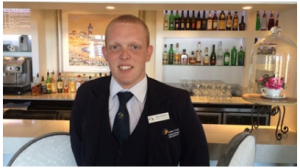 This Cape Town Hotel School student is a cut above after being awarded a generous bursary and industry body subscription. Third-year student, Deen Hopcroft, was awarded a R20 000 bursary and a year’s subscription to the Federated Hospitality Association of South Africa (Fedhasa). Fedhasa, the official representative of the hospitality industry of South Africa, approached hotel schools in Cape Town and encouraged third-year students to apply for the bursary opportunity. Shortlisted candidates were invited for interviews at the association’s local offices in Century City. The money would go towards his third-year’s tuition fees. Deen says the selection criteria included academic performance and experience in the hotel industry as Fedhasa wants to invest the money and the opportunity in someone who will shine in the industry. He says it gives him great excitement and is a load off his shoulders to have been awarded the prestigious bursary as he can now focus on his studies and the business he started recently. “Two months ago, I started Master Bar Events, a company which stocks bars and hire out bartenders for events of any size,” he says. He says the Fedhasa subscription will be a great opportunity for him to network with people in the hotel industry as well as keep him updated with industry news and latest developments. “It will provide me with training opportunities from other general managers who will share tips and skills that helped them to get to where they are,” says Deen. He hopes to go to London soon for his six-month internship and then come back to enrol for a BTech degree next year.